← I’m ready for my close-up, Mr. DeMille. . . .
oh what a wonderful surprise! how truly wonderful…. you will snap some photos of the resulting flowers, won’t you? I will be happy to, Clay. I actually took this photo yesterday. It’s amazing to me how much the buds have shot up in one day! hope you are safe and warm…. can’t wait to read your post (I am making an assumption) on Nemo… take care and I hope your present is blooming and bringing joy into your home! Thanks, Clay. Except for an awful lot of snow, we are are safe and warm. 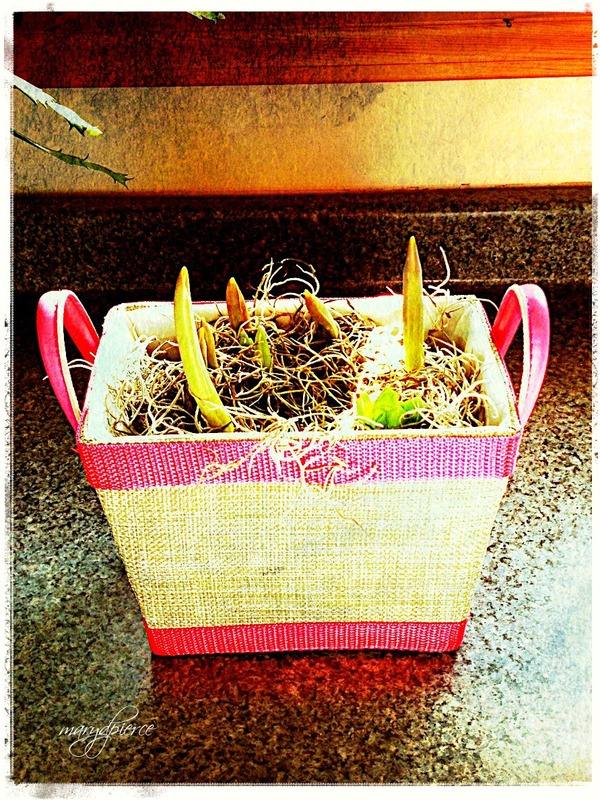 My spring basket of flower isn’t quite blooming yet – nearly, though. How nice! I’ll wager I know who sent those, even though I don’t know you well, Mary! I won’t wager, Lorinda, because you’re right! Thanks, Jill. I think so, too – on both counts! I hope they bloom and bloom well into actual spring. So hoping you had a wonderful birthday, Dear forever young Friend. I had a quiet birthday – way too cold to go out! Still, it was lovely, and it feels like it’s still going on, thanks to you and Ray! Thank you, Ray. For so many things….!!! This is so nice. Who’s Ray? Ray, as in Andy & Ray. My friends who live in Florida. Happy birthday. When was the actual day? Thank you! My birthday was actually January 25th. No wonder we get along! Mine is the 23rd. We winter birds must stick together. Another Aquarian. Next year we’ll have to throw a virtual birthday party to celebrate! Oh, that’s lovely. Good thing you followed your instinct to bring them in, or they probably would have frozen! That happened to me on Valentine’s Day, when the driver left a clearly marked plant outside in the snow, and didn’t even bother to knock. Sheesh. I thought about that after I opened the package. Lucky, I have a good UPS driver who walks the packages down the driveway and leaves them on my porch. He often knocks, but not always. Maybe because he did this time because saw that package contained a plant? I know, right?! And I don’t even have to do any gardening to enjoy the blooms! Oh, lovely, spring in a basket! I’m so glad you followed your instinct and brought them inside. I am too. I would have been horrified if those bulbs had frozen because I was too afraid of the cold! I had that happen once. Someone sent me an amaryllis bulb at Christmas and it sat on my doorstep in 10 degree weather all day. When I planted it, it simply turned to mush.